When I joined the New Hampshire Modern Quilt Guild, I anticipated making new quilty friends and honing my quilting skills. 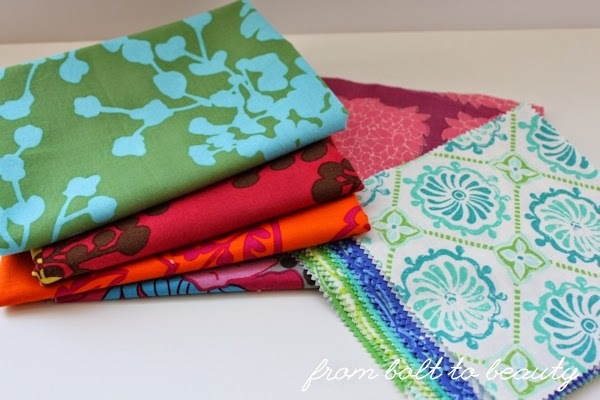 And sure enough, between our monthly meetings, a sew-in, and a retreat, I have learned a lot and have got to know my fellow fabric-loving, quilt-obsessed guild members better. When I initially joined, however, I didn’t expect that we would also use our skills at the sewing machine for good, and it’s proved to be a highlight of my guild experiences. 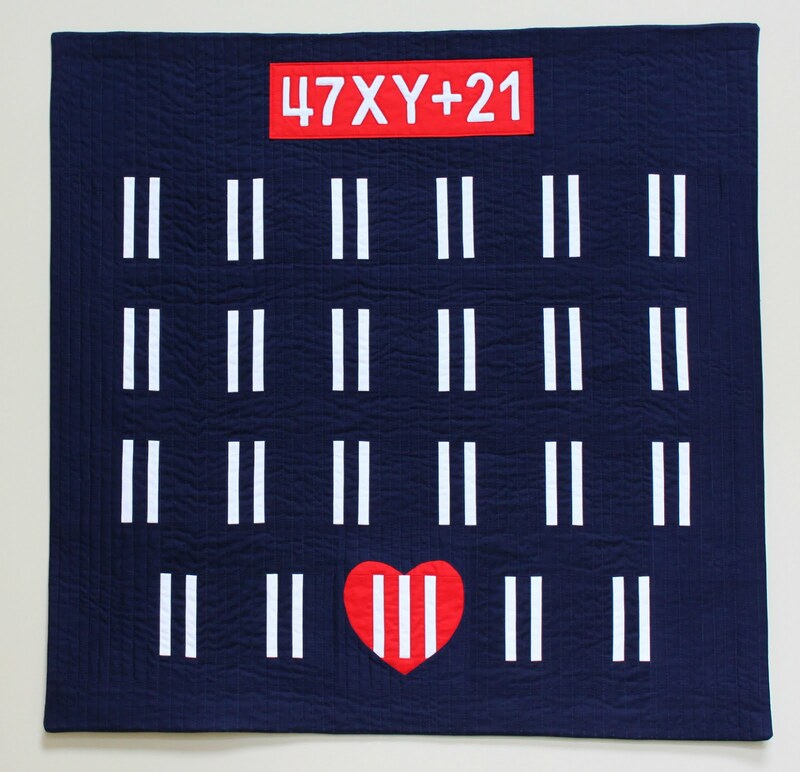 Using fabric donated by Hawthorne Threads and this online tutorial, we made our X-plus quilt to support a local shelter for victims of domestic violence. 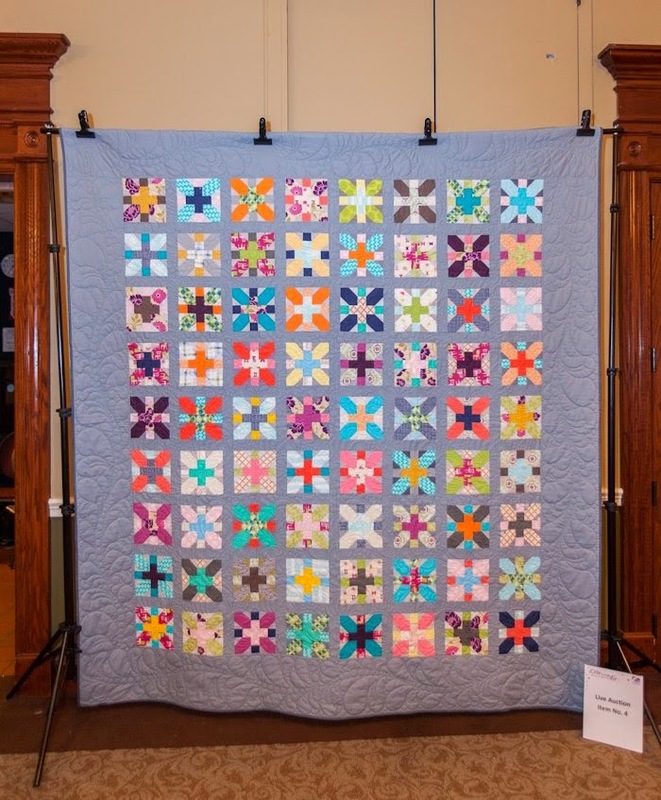 And when the organization held a benefit and auction back in February, our quilt sold for $1,000! My guild was really excited about this success, and knowing that I contributed to something so worthwhile compelled me to participate in our current charitable effort. 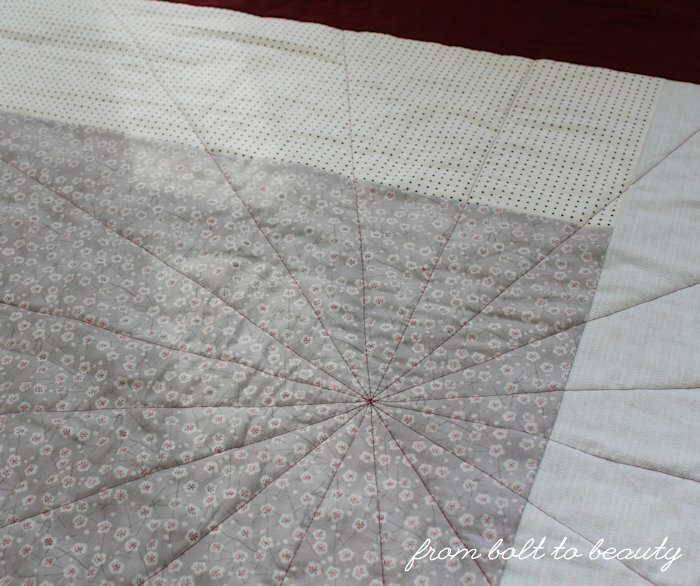 The blocks for this quilt start with a simple nine-patch trimmed out in a solid. When they are set on point and staggered, however, a secondary chevron pattern emerges. Brilliant, right? I wish I could take credit for the design, but it’s Pat Sloan’s Stitched quilt pattern. I also wish I could take credit for the color palette we’re using, but it’s another guild member’s great idea. I think the aqua and orange nine-patches paired with all that navy is going to look incredible and very modern. Once it’s done, we’re aiming to donate this quilt to another organization’s auction. What Happens on Retreat Stays on Retreat? Last Friday, I joined my fellow guild members on retreat, in Maine. I left Massachusetts with a bag full of cut fabric, a few patterns, and one or two if-I-have-time projects. Two days later, I returned with a pieced Christmas table runner, a partially pieced scrappy quilt, and 32 new yards of fabric. Eep! We also shopped. I was pretty psyched when I scored 3 yards of Lizzy House’s Hello Pilgrim at a first fabric stop en route to Maine. These are from Lizzy House’s Hello Pilgrim line. I went for the brown colorway (and finished off the bolt) but bought the greens just in case. But then, my traveling companion, Chelsea, and I made our first-ever visit to Marden’s. It was a game changer. Marden’s is a big discount store, and the one in Sanford, Maine, has a huge fabric department. Nothing was more than $4.99 a yard. Check out my loot. I made some smart fabric choices, right? Then, while we were at the retreat, Marden’s got a brand-new shipment of top-quality fabric. 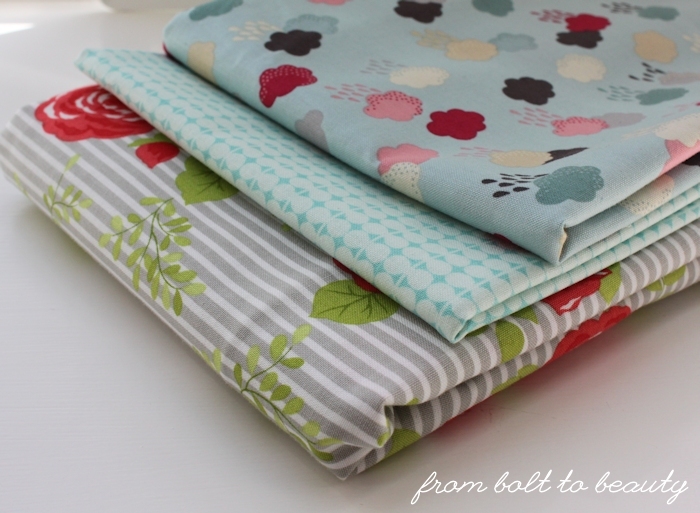 We went back, and I bought 18 more yards of fabric—because Marden’s is awesome. I am such a Moda girl. 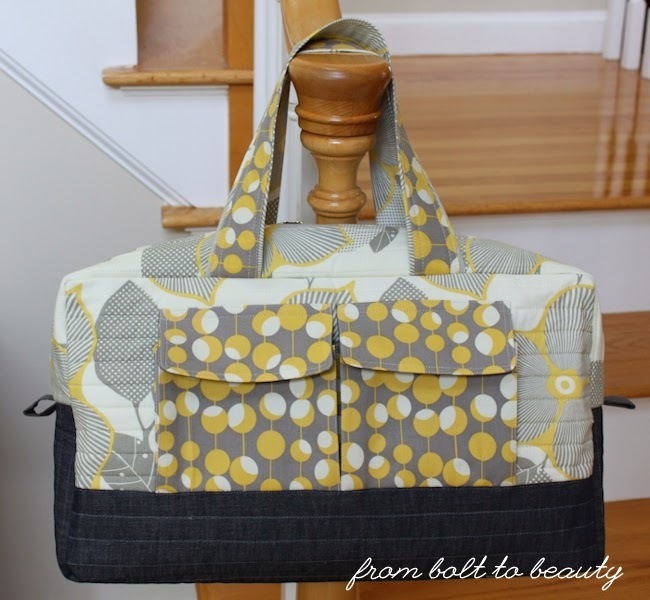 Everything here is Moda—Cosmo Cricket, Zen Chic, Bonnie and Camille—except for the bottom fabric, which is an old Midwest Modern design from Amy Butler. I couldn't resist these Heather Ross designs. The bees make me so darn happy. I mainly bought a yard or two of each fabric, but these were the more generous cuts for backings. 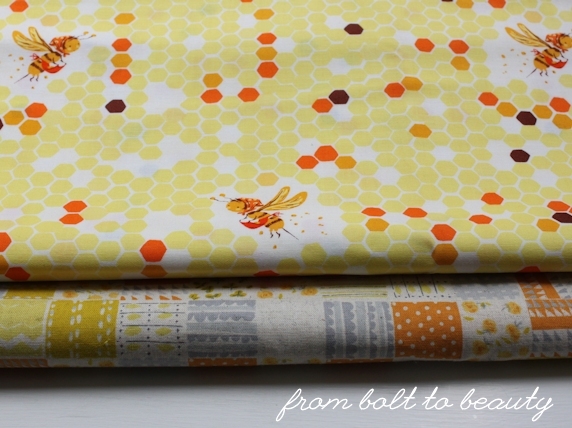 The birds are Sweetwater for Moda, and the moons are old Lizzy House (4 yards of it—woo hoo!). 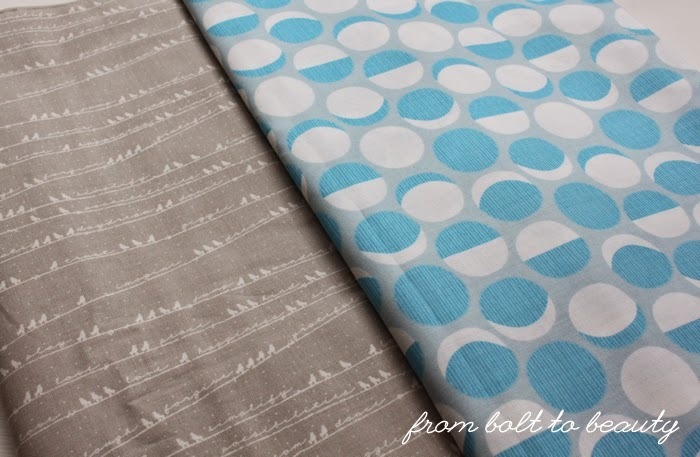 Sure, inexpensive fabric from top designers is fun to buy, but the lower prices fundamentally changed how I picked fabric. I wouldn’t pay $12 a yard for that AMH print (third picture from the top) unless I had a specific project in mind for it. 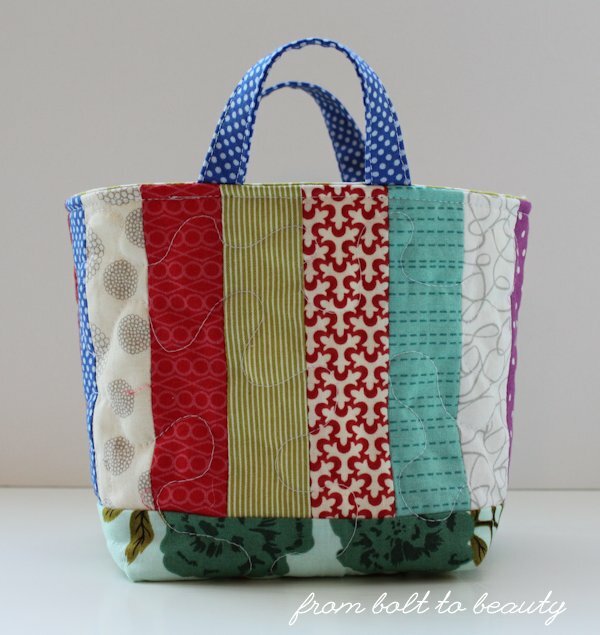 It’s an out-there large-scale design best suited for a bag or a quilt backing. 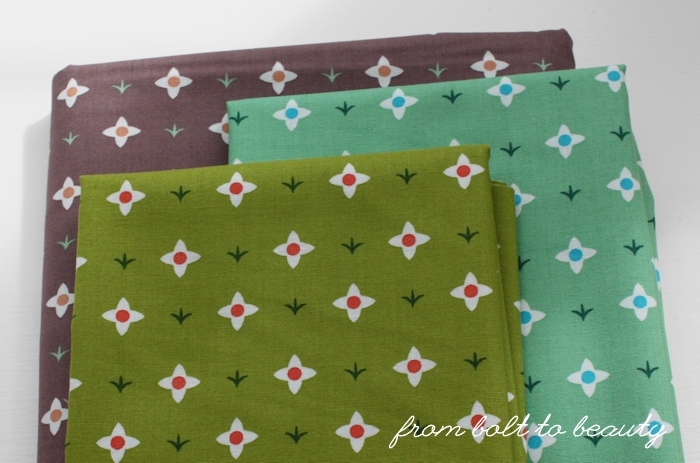 When that same fabric is less than $5 a yard, however, I’ll take a chance and find a use for it eventually. The only fabric I chose with a specific project in mind is the birds. They are going to be the back for the scrappy quilt I partially pieced at the retreat. I like the idea of a single, simple design on the back of something super scrappy. I am one happy quilter. My only dilemma? Where am I going to store all this new fabric?! As I’ve mentioned in previous posts, I’ve honed my scrap-saving techniques over the past year. I keep everything that’s a 2.5-inch square or larger, sorting the fabric by color and storing it in a big old bin o’ scraps. 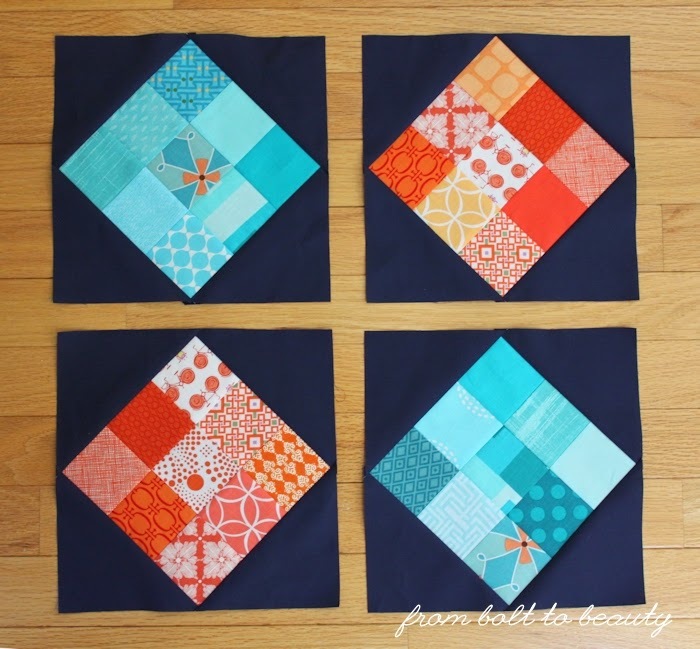 I’ve since realized that there was another category to consider: those neglected tiny scraps. Some of them are pretty awesome fabrics from pretty awesome designers, and I feel guilty tossing them. Although I don’t want to keep track of these little bits, my friend Chelsea loves scraps of all sizes, so my sewing room now includes a going-to-Chelsea scrap bag. Chelsea made this Friendship Bag (check out the tutorial) for a Yankee swap with some of the scraps I’ve given her. It’s fitting that I ended up being the recipient of the bag during the swap. See? It’s the ideal life cycle of fabric scraps. Give them away and get them back in a new form! I’ve recently added a third category to my efforts: stuff that doesn’t inspire me anymore. 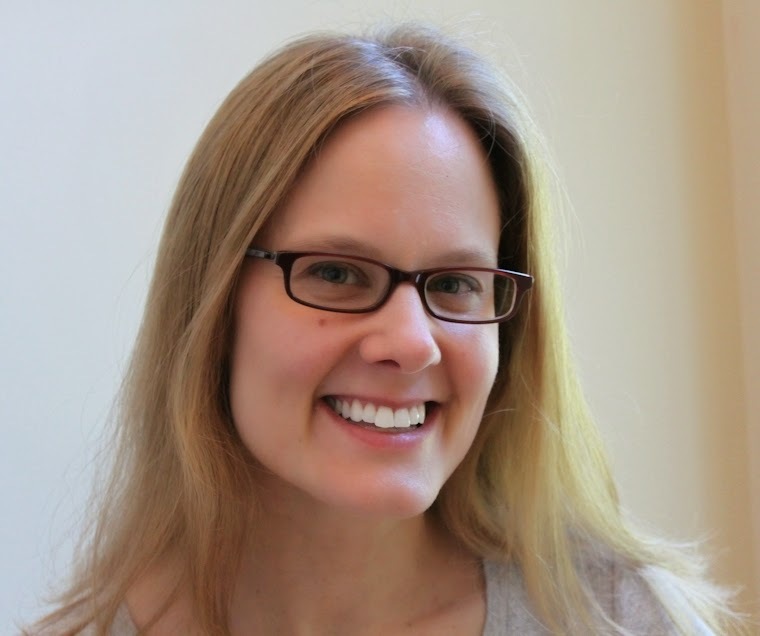 A case in point is Denyse Schmidt’s Hope Valley. For the record, I adore this line of fabric. I had the entire line in fat quarters with yardage on top of that. 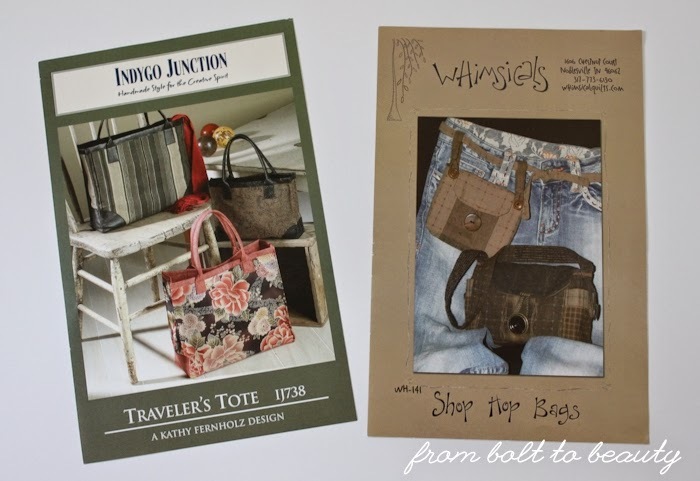 It’s the foundation of my (aptly named) Hope Valley Quilt, and Hope Valley scraps appear in one of these Jane Market Bags, this Noodlehead bag, my Scrappy Color Wheel Quilt, and other projects I’ve long forgotten about. At this point, however, I’m Hope Valley–ed out, so the scraps and leftover yardage are set aside for another friend. 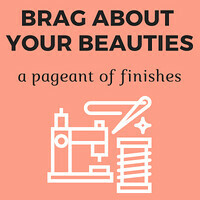 I’m not the only one who sees the benefit of passing on unwanted or uninspiring scraps. In fact, I’ve received scraps from two friends recently. 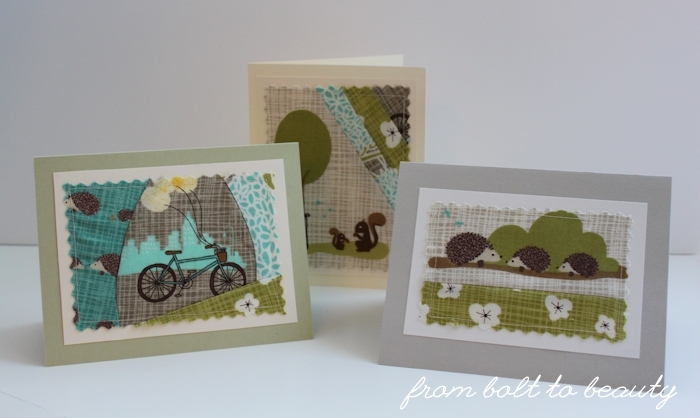 It’s hard to go wrong when hedgehogs are involved! Then there’s my Cargo Duffle Bag, designed by Anna Graham of Noodlehead. (For the free pattern, visit the Robert Kaufman site.) 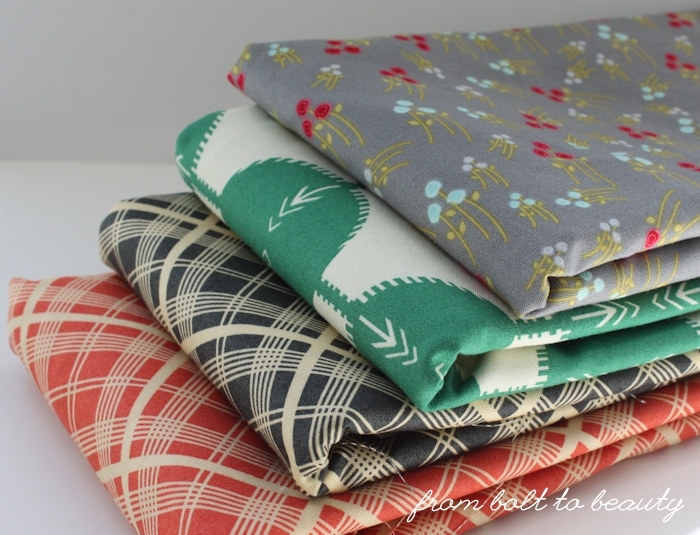 Miss Kim sent me generous cuts of Amy Butler’s Midwest Modern line that were left over from a baby quilt. I was going to use them in a gray and yellow quilt of my own, but the fabric didn’t match up to the grays and yellows I had already purchased. Naturally, my solution was to use these scraps in a bag. I’m pleased with the results and look forward to taking this duffle on my sewing retreat this weekend. OK, this lovely still needs snaps, but she’ll be done in time for Maine! UPDATE: Both fabric bundles have been spoken for. All that remains is the patterns. Thanks! 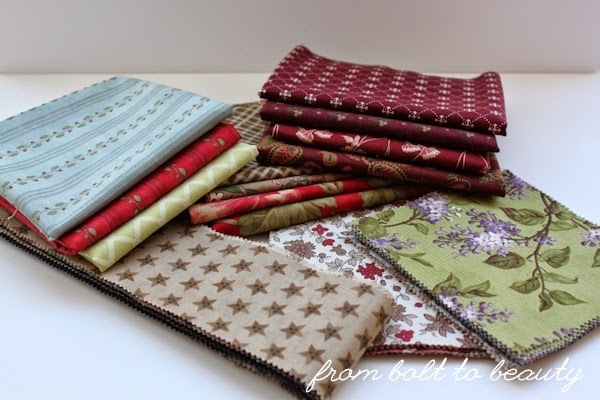 In the spirit of passing along scraps that I no longer want/need/find inspiring, I have two bundles that are up for grabs. 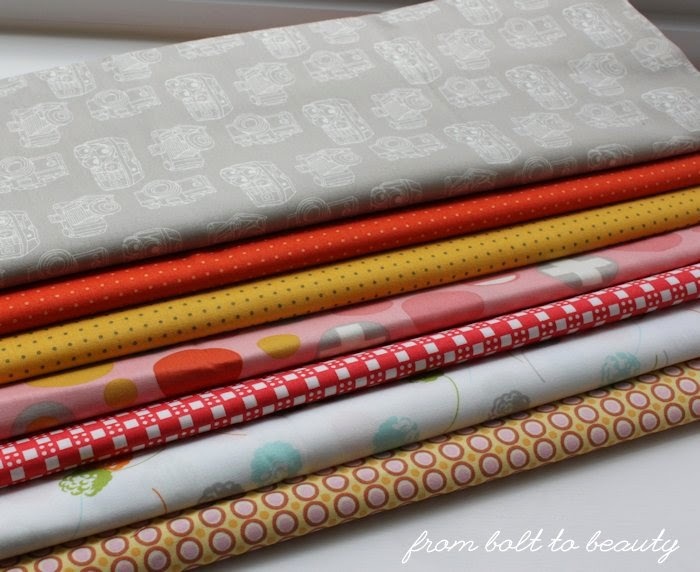 There’s a pile of brights (first picture below) that includes three fat quarters from Amy Butler and others and a pile of charms from Kate Spain’s Horizon collection. 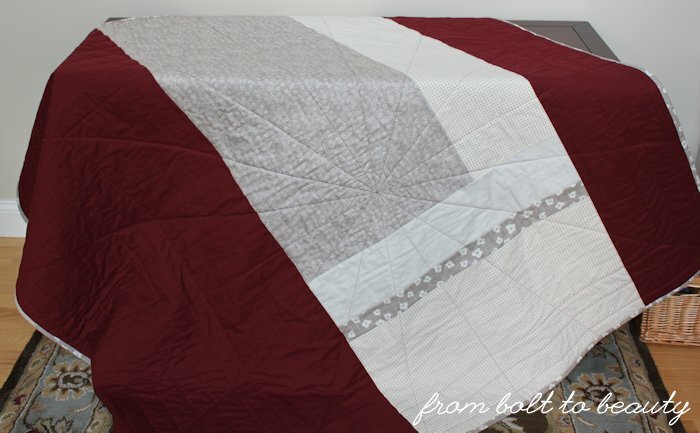 The traditional lot (second picture below) is more substantial, with burgundy quarter yards that didn’t make the cut for this quilt, plus pieces designed by Brannock and Patek and by 3 Sisters. If you’re interested, leave a comment below, indicating what you’d like, and I’ll ship it to you. First come, first served. No-reply bloggers, please include your email address in your comment. I’ll contact interested readers via email to obtain mailing addresses. Sorry, folks, U.S. mailing addresses only. These piles are too small to justify sending them up to Canada or overseas. 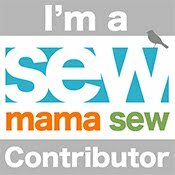 My May giveaway, part of Sew Mama Sew’s Giveaway Day event, will be open to international addresses. Promise! 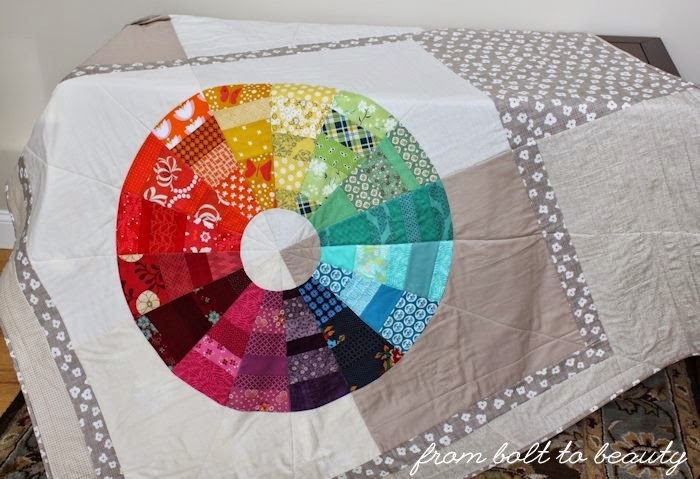 A curious phenomenon occurred between piecing and quilting my color wheel mini: It became a throw. I loved this project from the get-go and worked hard at fine-tuning the color transitions (see here and here). 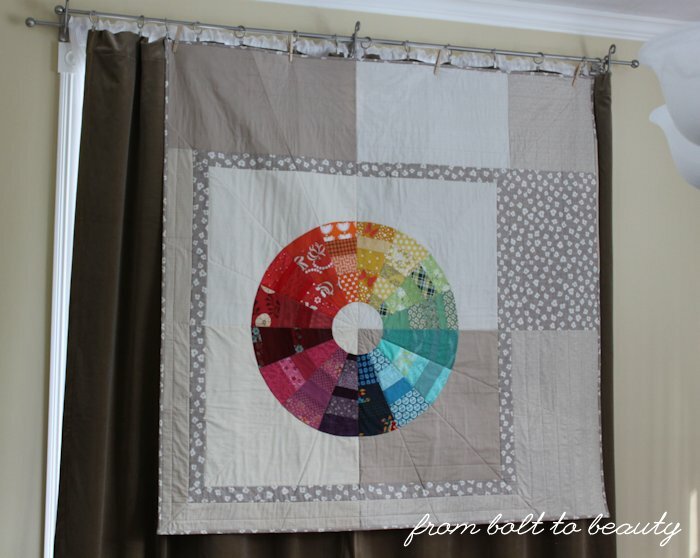 But once I realized what a 40-inch quilt would look like hanging from my bedroom wall, I had to regroup. There just isn’t anything mini about a quilt of that size. I added to the length and height of the quilt easily enough. Then it was time to quilt. Sigh. Quilting never goes smoothly for me. I started by quilting along the wedges of the color wheel, extending each line to the edge of the quilt. Then I began echoing the border around the wheel. That’s when I saw puckering where those horizontal and vertical quilt lines intersected the lines radiating from the color wheel. I spray my quilts all over (as opposed to Elizabeth Dackson’s approach of spraying every few inches, which I have since tried on another, yet-to-be-blogged-about quilt). I encountered some tutorials online that recommend setting basting spray with an iron. If that contributed to my problem, it was too late to fix it. I put that advice in my back pocket for another project and another day. 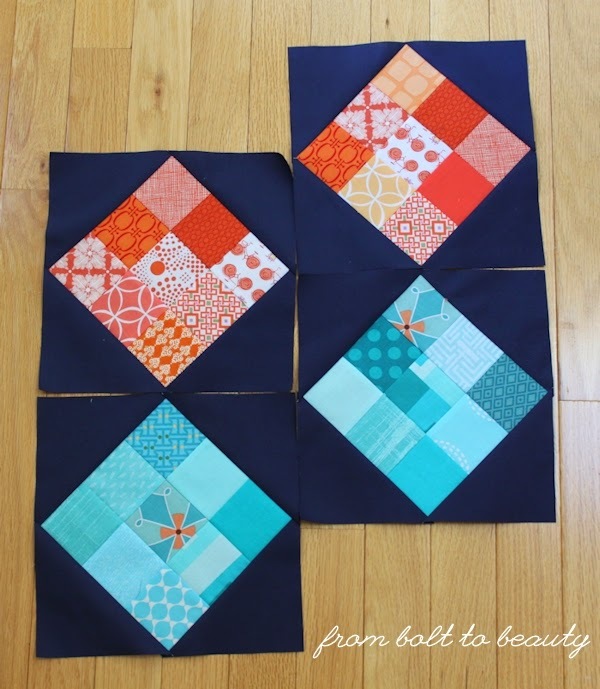 Was starting with diagonal quilting lines contributing to the problem? My friend Kim and I discussed whether I was inadvertently stretching the fabric by quilting lines on the bias before quilting lines on the cross grains of the fabric. It was something worth considering, but if I stretched the fabric, there was no recourse. Stretched fabric is stretched fabric. Again, it was a factor I’d keep in mind for future projects. Was I missing an opportunity to flatten out the fabric on the fly? Another friend, Sarah, asked whether I wore gloves while quilting. I don’t—I consider them an accessory for free-motion quilting, not straight-line quilting. She showed me how she uses gloves to flatten problematic sections and avoid pin tucks like the ones I was experiencing. This was a technique I could try on this quilt, even at this stage. In the end, I put the quilt in time-out for a few weeks. When I was ready to deal with it again, I ripped out a significant amount of the straight-line quilting outside of the color wheel itself (it’s worth mentioning that both Kim and Sarah cautioned me against this, but hey, I am a stubborn lady with perfectionist tendencies!). Then I started quilting again, this time working from the opposite direction I originally worked in, which meant I always had more quilt rolled up inside my sewing machine than I did hanging off of it. I also wore gloves and tried Sarah’s suggestion. It wasn’t easy to do with a spray-basted quilt; I had to loosen some sections to better manipulate the fabric. Together, however, these measures avoided any puckering. Woo hoo! I was happy to use an Autumn Woods print, by Kate & Birdie, on the quilt top and binding. I used every bit of the yard I had on hand in this quilt. This is a very me backing. I love how the two long swaths of Kona Brick frame the center patchwork. I’m so pleased with how the quilting looks on the back, and I was happy to use that Edo Blossom print from Makower UK so prominently. Love it!